I recently returned from a beach vacation. One of our daily rituals was slathering on SPF 50 sunscreen to try to protect ourselves against the blazing sunshine. We wanted to be in the warm sun rather than the gray cold Midwest, obviously, but we’d accepted the healthcare cautions about sunshine and skin cancer, and so the sunblock went on. But what if the healthcare cautions that led to our lubing up are wrong — as in, 180-degree wrong? What if exposure to sunshine is not only not bad for you, but in fact it helps you to be healthier in countless ways, by effectively and efficiently producing vitamin D, lowering blood pressure, making you feel happier, and having other therapeutic benefits? That’s the intriguing conclusion of recent research that started with a look at the value of vitamin D supplements — which many people who avoid the sun are taking to try to compensate for the lack of solar-produced vitamin D. Low vitamin D levels are associated with lots of bad stuff — cancer, diabetes, obesity, osteoporosis, heart attack, stroke, depression, cognitive impairment, autoimmune conditions — and vitamin D is required for calcium absorption and good bone health. So vitamin D supplements should help, right? But the research showed that vitamin D supplements weren’t having any discernible impact on cancer, heart disease, or stroke. But wait — won’t getting more sunshine cause skin cancer? Yes, there is that risk — but the article points out that skin cancer is not nearly as lethal as the other diseases and conditions that exposure to sunlight helps prevent. And, additionally, people who regularly get sunshine, avoid sunburns, and keep their tans going — like outdoor workers — are much less likely to experience melanoma, the less-common but potentially fatal kind of skin cancer. In fact, the evidence indicates that long-term exposure to sun is associated with lower melanoma rates. All of this will come as a surprise to people who are scared to death of skin cancer and buy sunblock by the carload, but it makes sense from an evolutionary standpoint. Our half-naked distant ancestors didn’t have SPF50 to apply, and they were exposed to the sun on a much more prolonged basis than modern, largely indoor humans. It makes sense that humans would evolve in ways that would favor those who were more efficient in using that abundant, constant sunshine in positive, healthy ways. Think about that the next time you’re carefully applying that SPF50 sunblock and popping down vitamin D pills. Did you make a New Year’s resolution? If so, how’s it going? According to a social network called Strava, which somehow conducted some research into the topic, most people who make New Year’s resolutions end up breaking them by January 12. So hang in there: you apparently only have to suffer through a few more days of compliance before you can go back to those old habits. The Strava research seems to have focused on exercise and dietary resolutions, which are probably the most challenging resolutions of all. People buy that health club membership and start eating leafy green vegetables for dinner with the best of intentions, but are felled by unrealistic expectations of what will happen. When those unrealistic expectations aren’t met, they fall off the wagon. And then, after they fall off the wagon, they figure it’s hopeless to try to change and totally give up. 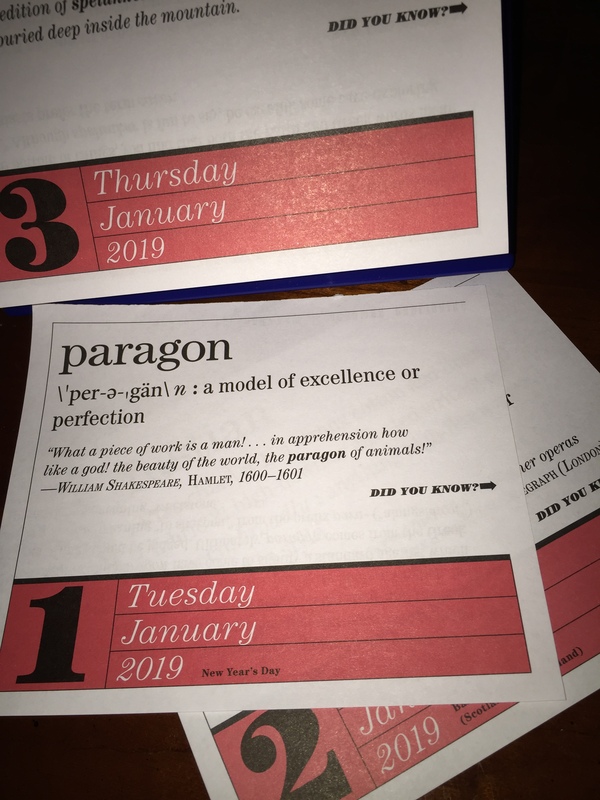 I think making resolutions makes some sense, and the start of a new year is as good a time as any for some self-reflection and consideration of how a beneficial behavioral change might be in order. There’s nothing wrong with trying to get more exercise and be more healthy, but why stake your New Year’s resolutions entirely upon goals that experience teaches are incredibly difficult to reach? Maybe we should start small, and think about little, reasonably achievable resolutions that might just make you a better person and improve your life at the same time. Consider, for example, this list of 58 New Year’s resolutions that don’t involve dieting or exercise. It’s not exhaustive and right for everyone, of course, but it may give you ideas for the kind of resolutions that are suitable for you. This year, I’m going small with my resolutions. I’m going to clean out my closet and give the clothes that aren’t being used to a charitable organization. I want to go through what we’ve got stored in the basement and the pantry, figure out whether we’re using it, and donate what’s unneeded to the Goodwill. I’m going to tackle my emailboxes and iPhone photos, delete what I don’t want to store forever, be happy about the reduced clutter, and see whether that improves my phone battery life. And while I’ve done a better job of leisure reading this past year, in 2019 I’m going to up the ante by identifying and then reading through to the end at least one really mentally challenging book. Making goals is a good thing, but reaching those goals is even better. With the sun having set on 2018, may you find health and happiness in 2019! Parenthetically, this reminded me of when I was in college and the Ohio State Lantern carried a similar, extremely popular feature, in which one of the doctors at the University responded to student health questions. Since the questioners were college students, the tone of the inquiries wasn’t exactly elevated. I remember that one of the questions fielded by the doctor came from an oddly observant student who wondered why some of his toilet deposits sank to the bottom of the bowl while others floated. No doubt the doctors who agree to write such columns wonder, from time to time, whether this is really why they went through the hell involved in getting an M.D. But although the studies reported in the Times detected some evidence of “traveler’s constipation,” which apparently is primarily noticed during the first days of travel and often correlates with jet lag, whether the condition is caused by travel isn’t exactly clear. The studies note that travel also often involves changes in diet and exercise — sitting at an airport gate eating something purchased along the concourse isn’t exactly designed to promote “regularity” — and the Times doc also notes that a significant portion of people, from 12 to 19 percent, are generally constipated whether they are traveling are not. That may explain why it’s not unusual to meet grumpy people in the world. It’s also not clear whether the studies also looked at another potential cause for “traveler’s constipation” — namely, a concerted effort on the part of mind and body to avoid having to use a dubious public airport bathroom — that might contribute to the condition. The good news, though, is that the Times doc concludes that “traveler’s constipation” is not a serious health problem. In short, it too shall pass. Earlier this week I was having lunch with a younger colleague in a busy airport, talking about how tough it is to juggle the demands of young children, a work schedule that involves lots of travel, and other elements of modern professional life in America. As she noshed on her salad, she mentioned that at times she took out her phone and used “Calm” and “Buddhify” to help her reduce stress. Eh? There are smartphone apps geared toward meditation? Yes, she explained. They are part of the “mindfulness” segment of smartphone apps, and then she described how you can use the apps to look at calming scenes, hear soothing sounds, and select mediation routines that are specifically targeted to helping you deal with a particular scenario, like getting to sleep or dealing with stress at work. She then thumbed through her phone app index pages in a way that made it clear that she had a lot of apps. My younger cousins have a lot more apps than I do, she said — dozens and dozens of index pages of them. I thought about my smartphone, with my skimpy two pages of apps, most of which came with the phone, and I felt apprehension and, frankly, inadequacy. And as my colleague showed me some of the other apps she has on her phone — apps like TuneIn, which allows you to listen to sports broadcasts of your favorite teams wherever you are, or Happier, which helps you think most positively (UJ must already have that one), or Pandora or Spotify, which allow you to listen to lots of good music of your choosing — I realized, again, that there’s a huge world of potentially useful or enjoyable apps out there and I am completely oblivious to them. My poor, underutilized iPhone is like what they used to say about the human brain — it’s using only about 10 percent of its potential. But here’s the problem for me. How do you find the good apps? Is it primarily word of mouth? Do people regularly have conversations about apps, and discuss which ones, in their experience, are worth it or not? Or do people do on-line searches for app ratings and comments? Or do they go to the app store and just look around and try things out? I’m feeling a bit lost here. But if I can find an app that transforms modern business travel into more of a zen-like experience, for example, I’m willing to work to find it. Back when UJ used to write for this blog, he added a tag for “happiness” because he wrote a number of posts about it. I regret to admit that, since UJ stopped his scrivening, it’s probably the least-used tag on the blog. In fact, this post is likely the first one with a happiness tag in months, if not years. I consider myself a happy person, but I just don’t write much it. Apparently, Yale students also need help with happiness. This semester Yale is offering Psych 157, a course called “Psychology and the Good Life.” It tries to instruct students on how to be happier — and it has quickly become the most popular undergraduate course Yale has ever offered. 1,200 students, which is about 25 percent of the entire undergraduate student population, is taking the course. The professor posits that Yale students are flocking to take the course because “they had to deprioritize their happiness to gain admission to the school” and in the process adopted “harmful life habits.” If you read the article linked above, you’ll conclude that Yalies are a pretty sad, stressed bunch. When I was going to college, lack of happiness and “deprioritizing” personal happiness and fulfillment was not a problem. If anything, Ohio State students of the ’70s tended to overprioritize their dedicated, incessant, deep-seated, Frodo Baggins-like quest for happiness. The notion that fresh-faced students, still possessing the bloom of youth and newly freed from the constant supervision and irksome rules of Mom and Dad, need to take a college class to learn how to be happier would have been totally alien to the undergrads of my era. And it’s really kind of depressing to think that, in any era, college students would need to sit in a lecture hall to get tips on how to be happier. College must have become a grim, hellish place indeed! But this is where UJ comes in. He’s always got a happy grin on his face, a positive outlook, and a firm belief that “life is good.” Sure, he’s retired, but his youthful attitude should allow him to connect with the legions of sad, beleaguered, put-upon Yalies who just don’t know where to find happiness in their soulless, barren college lives. Hey, UJ! Time to call that Psych 157 prof and offer a few pointers!